WBHRB Notification is out. 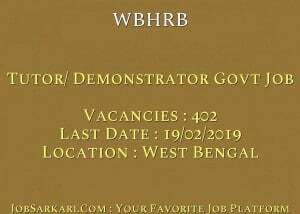 WBHRB is recruiting for 402 Tutor/ Demonstrator Govt Job Posts. You can check WBHRB - West Bengal Health Recruitment Board last date, download WBHRB notification, visit WBHRB official website and check other WBHRB Vacancy details.Complete Vacancy and recruitment Details about 402 Tutor/ Demonstrator Govt Job vacancies in WBHRB are provided below by JobSarkari.Com only for you. Mode of Payment. Candidate Need to Pay Application Fee Through Net Banking in GRIPS Govt of West Bengal At Govt Receipt Head of Account ‘ 0051-00-104-002-16’. General Medicine 19 03 05 08 04 02 41. General Surgery 19 03 06 09 05 02 44. Anatomy 12 02 01 04 02 00 21. Physiology 05 01 01 03 02 01 13. Biochemistry 09 03 01 03 02 01 20. Pharmacology 04 01 00 02 01 01 09. Pathology 06 01 01 02 01 01 12. Microbiology 03 01 01 02 01 01 09. Toxicology(FMT) 03 00 02 01 02 01 09. Community Medicine 05 01 00 02 02 01 11. Paediatrics 01 01 02 01 00 00 05. Chest Medicine 03 00 01 02 03 00 09. Dermatology 07 01 02 03 00 00 13. Psychiatry 02 01 00 01 00 00 04. Orthopaedics 06 02 00 03 01 02 14. ENT 00 00 01 00 00 00 01. Ophthalmology 03 00 01 01 01 00 06. Obstetrics & Gynaecology 00 00 00 00 00 00 00. Anaesthesiology 26 05 05 10 07 03 56. Radiodiagnosis 05 01 00 02 01 01 10. Nephrology 04 01 01 03 01 00 10. Urology 04 01 01 01 01 01 09. Neuro Medicine 02 01 01 02 01 00 07. Neuro Surgery 05 01 02 02 01 00 11. Cardio-Thorasic & Vascular Surgery (CTVS) 02 01 02 04 01 00 10. Cardiac Anaesthesia 00 00 01 00 00 00 01. Paediatric Surgery 02 02 00 03 01 01 09. Medical Gastroenterology 00 00 01 00 00 00 01. Neonatology 00 00 01 00 01 00 02. Physical Medicine 00 00 01 01 01 00 03. Medical Oncology 00 00 00 00 01 00 01. Radio Therapy 03 01 02 01 00 01 08. Endocrinology 00 00 01 01 00 00 02. GI Anaesthesiology 00 00 00 01 00 00 01. Haematology 01 01 01 02 00 01 06. Blood Transfusion 01 00 00 00 00 00 01. Rheumatology 00 00 00 01 00 00 01. Cardiology 01 01 00 02 01 00 05. Surgical Gastroenterology 00 00 00 01 00 00 01. Surgical Oncology 01 00 00 00 00 00 01. Tropical Medicine 00 00 00 00 00 00 00. GI Pathology 00 00 00 00 00 00 00. Neonatal Surgery 00 00 00 01 00 00 01. Plastic Surgery 02 01 01 00 00 00 04. Total No. of Post 166. 38. 46. 85. 45. 21. 402. Candidate Must Have Passed MBBS degree included in the First Schedule OR Second Schedule OR Part II of the Third Schedule of the Indian Medical Council Act As Mentioned in Notification. 5. Online Application Can be Submitted On or Before 19th February 2019. Q. 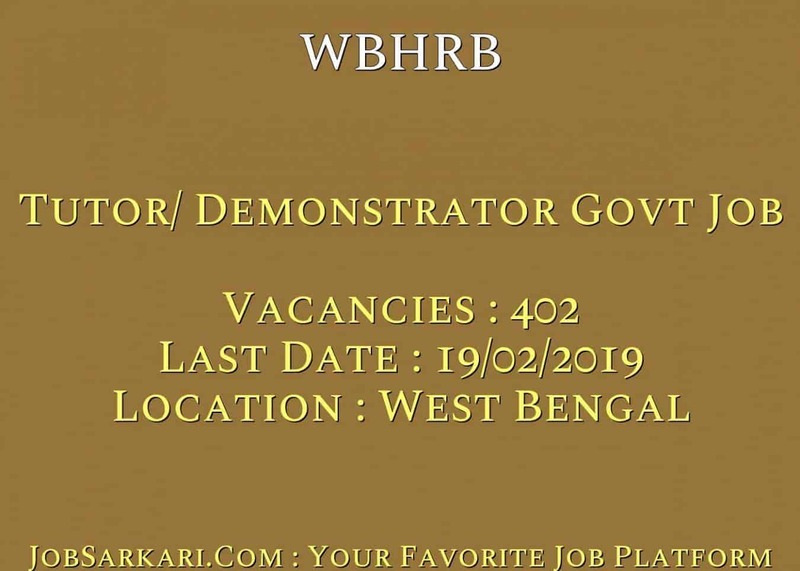 What is the Last Date For WBHRB Tutor/ Demonstrator Govt Job Vacancy ? A. Last Date for WBHRB Tutor/ Demonstrator Govt Job Posts is 19/02/2019. Q. What is the Form Type of WBHRB Tutor/ Demonstrator Govt Job Recruitment ? A. The Form Type for WBHRB Tutor/ Demonstrator Govt Job Posts is Online. Q. How many vacancies are available in West Bengal Health Recruitment Board Tutor/ Demonstrator Govt Job Posts ? A. There are about 402 Vacancies in West Bengal Health Recruitment Board Tutor/ Demonstrator Govt Job Posts.